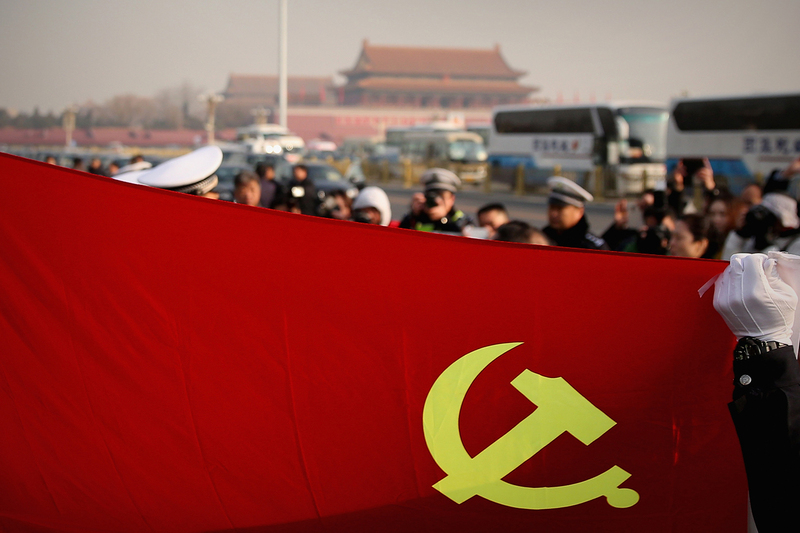 Policemen holding the flag of the Chinese Communist Party pose for photos during the opening session of the National People’s Congress, in Tiananmen Square, Beijing, March 5, 2015. To learn more about the Foreign NGO Law and to stay updated on latest developments, please visit The China NGO Project, a ChinaFile initiative. Debate on the two laws has been split between careful optimism and strong disquietude. Domestic observers, with their focus on the Charity Law, seem to be the more sanguine group. There are reasons to vindicate both positions. But here’s a much more pedestrian thought: what if these laws are neither breakthroughs nor auguries of the death of civil society in China? What if they are just a continuation along the same general trajectory? It helps to understand the two laws in the context of the Chinese Communist Party’s (C.C.P.’s) broader project to modernize the way China is governed. This project relies on a combination of “rule of law” and “rule by virtue,” which entails building up the legal system and promoting “Chinese virtues” and core socialist values. In China, just as anywhere else, the values and ideas championed by foundations can play a guiding role in shaping behavioral trends. For the C.C.P.’s project to work, it needs foundations—domestic and international—to fall into line. But we need to remember that enforcement is the biggest part. For many years, the old system of rules governing social organizations was implemented only haphazardly or selectively. This won’t change overnight whatever the intention behind the new laws. Look at the Charity Law’s effect on foundations after a year of implementation. By September 8, the number of charitable organizations accredited reached 2,237. Almost all of them (1,912) are foundations. But China has 6,203 foundations. Of this elite of newly anointed charitable organizations, only 529 have been accredited with the right to fundraise publicly. Most were already public fundraising foundations under the old system. The Law on the Management of Foreign Non-Governmental Organizations’ Activities in the People’s Republic of China, after eight months of implementation, has seen 156 foreign NGOs register one or more representative office. This is put into perspective by a study by Tsinghua’s NGO Research Center that estimates there to have been 10,000 foreign NGOs operating on the mainland before the Law. Of those that have registered under the new Law, many are foundations that were already registered with the Ministry of Civil Affairs before the Law. Many others are trade associations and chambers of commerce. The two laws are unlikely to have a major impact on the aims and orientations of individual foundations. But the C.C.P.’s initiative to steer their orientation more effectively will require new strategies and approaches to negotiate the evolving space. What the laws will do is create a more competitive market in the non-profit sector. This means foundations in general will pay increasing attention to project design and the public pull of their campaigns. We already can see prototypal forms of what an increasingly competitive market might look like. Tencent’s 9.9 Philanthropy Day, held September 7-9 since 2015, enables smaller organizations not currently permitted to fundraise to join the market. By teaming up with a foundation with fundraising status and establishing a project or special fund, for three days they can compete for public donations. These early experiments show that while the laws are shaping the broader environment, between them, foundations and other social organizations are shaping the rules of the market. The last year has clarified how leaders of the Chinese Communist Party (C.C.P.) view the role of civic organizations in development. The picture is mixed. While some groups are conducting amazing work dealing with social challenges, new regulations set clear limits on the realms of the permissible. Grassroots groups providing social support will be treated differently from those advocating for vulnerable groups; and domestic foundations will be treated differently from their foreign counterparts. The Charity Law, which came into effect in September 2016, seeks to clarify the situation, while ensuring that giving is channeled to those areas enjoying official support. On the positive side, the law provides a broad definition of approved charitable activities and opens the way to a wide array of philanthropic organizations. Crucially, organizations deemed reliable will no longer have to go through a process of double registration, finding first a sponsor and then registering with the relevant bureau of the Ministry of Civil Affairs. Now, they can skip the first step and register directly with the relevant bureau of civil affairs. Most importantly, public fundraising will be allowed but only if a license is obtained in advance. This new framework should encourage greater giving. In discussions with some of the new philanthropists, they indicate their interest in how to give back to the society that made them wealthy and what the most effective means may be. Despite coming from very different societies, they find empathy in the writings of former philanthropists, such as John D. Rockefeller, who have left legacies that exist well beyond their lifetimes. There is a similar fascination with the new technology philanthropists such as Bill Gates of Microsoft and Mark Zuckerberg of Facebook. This does not open a free-for-all. The role of the Party in new philanthropic and existing social organizations is to be strengthened and other regulations benefit those entities with close government or Party connections. These are the groups favored by their designation in the Charity Law. By contrast, advocacy for “marginalized groups” will be closely monitored and they will not benefit from future donations. Dropping the need to have a sponsoring agency will make it easier for those individuals with good records and connections to register their foundations or charitable trusts. However, public fundraising will be closely monitored due to the need to have an official certificate. By contrast, foreign foundations will be under greater scrutiny according to the new regulations. Double registration remains in place and there is a new obligation to register with the Ministry of Public Security rather than with the Ministry of Civil Affairs. The C.C.P. is far more likely to trust its own wealthy citizens, who are products of the system they control, rather than foreign entities whose true objectives may arouse suspicions. The result might well be an expansion of the Chinese third sector (voluntary and community organizations) while space for free association as part of a vibrant civil society may well contract. In 2016, China passed two laws in the social sector, the Charity Law and the Law on the Management of Foreign Non-Governmental Organizations’ Activities in the People’s Republic of China. Before these laws were passed, there were three types of registered social organizations, one of which was the foundation. At the end of 2016, there were 5,559 foundations, including 1,730 public fundraising foundations, 3,791 non-public fundraising foundations, 29 representatives of overseas foundations, plus nine foundations for foreign affairs. The number of foundations is rather small compared with China’s 702,000 social organizations overall, but foundations represent the country’s most active, transparent, and creative type of social organizations. After the passage of the two laws, the basic classification of social organizations was divided into charities and and non-charities. The difference between the three types of social organizations has become much less important than it was before. Any type of social organization gets special rights when it registers as a charity. Public fundraising is a qualification of charities, no matter whether they are foundations or not. For this reason, foundations—especially public-fundraising foundations—lost their special status. As of September 5, there were 2,142 registered charities, among which there are 1,854 foundations, dominated by public-fundraising foundations established before the passage of the Charity Law. Of these, 520 charities are qualified for public fundraising. About one-third of the public fundraising foundations remain qualified under the Charity Law. One year after the implementation of the Charity Law, foundations remain focused on charity: 86 percent are charities and, of those, 81 percent are qualified to do public fundraising. In the future, the public fundraising foundations may lose their advantage, little by little. Private wealth is in increased demand for philanthropy. Private foundations will still be an important source of charitable giving. One alternative is the charitable trust. Community foundations could be another growth area, as the revised regulations on foundations may allow registration at the county level. There was a sharp increase in the registration of foundations just before the implementation of the Charity Law, and then a slowdown, which showed the uncertainty about what to expect from the Charity Law. One year after the implementation of the Charity Law, it is urgent to revise the Regulation on Foundations to adjust the law. In Summer 2014, I spent one month in Beijing in order to conduct a series of in-depth interviews with European and Chinese foundation representatives. During my stay, the weather was good: strong winds prevented Beijing’s notorious smog from engulfing China’s capital. Politically speaking, however, the dark clouds of the draft Foreign NGO Law were already casting a shadow on China’s civil society. To my surprise, foundation representatives were willing to speak with me on the record. Despite risks that come along with greater publicity, in Spring 2015 interviewees gave China Development Brief (CDB) and the Philadelphia-based philanthropic consultancy Geneva Global consent to publish the full interview transcripts in English and Chinese on the CDB website. After my fieldwork in China and when presenting preliminary findings from my research at subsequent public talks in Germany and the U.K., I realized that many people have a rather one-sided understanding of foundation work in general and in China in particular. People either assume that foundations are highly political organizations that primarily fund anti-state activities abroad or, in the case of China, they assume that due to the country’s authoritarian government, foundations can only carry out very conventional charitable work. In my recently published open access article in the Journal of the British Association for Chinese Studies, I deconstruct the concept of seeing foreign foundations either as apolitical, and thus in line with the agenda of the Chinese Party-state, or as very political and thereby anti-state. In my view, such a conceptualization of foundations is misleading at best and a false dichotomy at worst. Doing my research, I learned that foundations have different value propositions, visions, and missions, as well as different theories of change which determine their philanthropic approaches. I realized that foundation leaders hold considerable sway when it comes to positioning their organizations. The interviews revealed that among my research sample, the domestic Sino-Ocean Charity Foundation was the only organization that primarily follows a conventional charity paradigm. Foundation representatives from the Robert Bosch Stiftung, One Foundation, China Charities Aid Foundation for Children, and the Narada Foundation revealed a primarily managerial understanding of philanthropy. The remaining foundation representatives from Misereor, China Foundation for Poverty Alleviation, SEE Foundation, Save the Children, and Oxfam had a primarily political understanding of philanthropy. When reviewing each of the interviews, I was struck by how little the nationality, ethnicity, or cultural background of foundation representatives mattered in terms of the interviewee’s paradigmatic thinking. It was a reminder that while foreign and domestic foundations are subject to different regulatory regimes, in terms of reported organizational practices, foreign and domestic foundations actually overlap in very significant ways. The Foreign NGO Law and the Charity Law will now open avenues for domestic foundations to grow at the expense of foreign grant-making foundations. Findings from my research suggest that in the foreseeable future, two groups of philanthropic foundations will coexist—an emerging group of managerial philanthropists aiming to introduce management approaches to China’s civil society sector, and more politically minded philanthropists aiming to bridge the gap between Party-state and civil society actors. The Rockefeller family (and its philanthropies) have a long history in China, beginning with the funding that established Peking Union Medical College more than 100 years ago, and continuing through the long history of the China Medical Board, still an active funder in public health. That timeline is brief, of course, compared with the long traditions of charity and community that go back thousands of years in China. So taking the long view, China’s Charity Law and Foreign NGO law are such recent arrivals that it’s hard to judge their impact over a matter of just months. Nor can we yet see clearly how their implementation is going to shape the civil society space. Are they harbingers of change? Symptoms of larger forces at works? Over the past decade, it’s become clear that charitable giving, grant-making, fundraising, and now impact investing are a growing part of Chinese culture. At Rockefeller Philanthropy Advisors, we see growing interest and significant activity at many levels in building out the philanthropic sector: vehicles for online giving; conscious efforts by organizations like the One Foundation to build trust among donors through clear reporting; green bond and other social offerings from financial firms; expanding university-based programs to train nonprofit professionals; the emergence of the China Foundation Center and other data resources; the development of philanthropy/charity institutes at, for example, Tsinghua University and the independent China Global Philanthropy Institute; and myriad programs for wealth-holders interested in learning about philanthropy. The new laws are part of this burgeoning sector, which needs the kind of legal and regulatory structure that all sectors of society ultimately require. Whether they will encourage more growth and development, or represent a shrinking of the space for civil society—as we see in dozens of other countries around the world—is a critically important question. Can balance be achieved to support innovative, entrepreneurial action in a vibrant sector with sensible safeguards? Only the long hand of history can write the answer to that question, but both Chinese and foreign organizations can keep that goal at the forefront of their work by pursuing shared social, environmental, and economic goals that bring together people and communities.